We stock a wide range of spare parts for kayaks. These fastenings & fixings can be used to secure rod holders, handles and other items to the deck of your kayak. We would recommend using some type of sealant to waterproof the boat when these fixings are used. 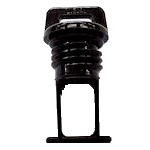 A single webbing carry handle with plastic covering. A pack of 5 nylon pad eye fixing points. A pair of plastic locking bungee hooks. Pack of 6 single hole lashing hooks. A Plastic Zig Zag Cleat. 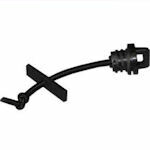 Snap eye bolt with swivel attachment point. 4 Way line guide deck fixings. Not sure which drain bung will fit your kayak? Please call us on 01202 625256 or send us an email to sales@bournemouthcanoes.co.uk to ensure you order the correct one. A feelfree drain bung including insert. Perception screw in drain bung. Dagger screw in Drain Bung. Ocean Kayak screw in drain bung. Not sure which hatch cover will fit your touring or sea kayak? A Valley kayak 8" round rubber hatch cover. A Valley kayak oval rubber hatch cover. A Dagger kayaks round rubber hatch cover. A Dagger kayaks oval rubber hatch cover. A Dagger universal backband large.